This week, we get the second instalment of Nigel’s SA water pricing investigation, we taste a ripper red wine from McLaren Vale, give in to our curiosity about the iconic children’s TV program, Curiosity Show (pictured), and agree that Adelaide is weird enough to be cool. We also revive Eagle On The Hill memories, get some history from that centre of young art known as Carclew, pair wine and chocolate, and hear about a Twitter coffee rescue in Stirling. Finally, we also become the ONLY podcast in the world that has discussed Tim Minchin and Humphrey B Bear on the same show. Wine tasting: Gemtree Vineyards 2011 Uncut Shiraz from McLaren Vale. Stories without notice: Colin emerged from a few days of sickness to enjoy a lovely ChocoVino experience at Handorf Hill Winery on the weekend. He’ll be going back again, sooner rather than later, and suggests everyone adds it to their ‘must do’ list. Steve told a tale of Twitter and a coffee rescue in Stirling. Nigel reported on his ongoing discussion with SA Water to get to the bottom of exactly how much water prices have risen by in South Australia in the past six years. Click to read the judgements from hearing 006. 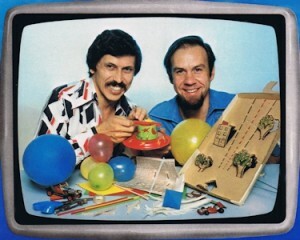 Adelaide’s Yesterdays with Colin: This week we fondly remember Curiosity Show and give thanks to Rob and Deane for making the show what it was for all those years, all those years ago! It was the best way to learn about science and the world around us – to be entertained and educated at the same time. Brett’s Musical Pilgrimage: Courtney Robb, Circles.